Clearing houses, or CCPs, were among the very few organisations to emerge from the global financial crisis with their standing enhanced. In the chaotic aftermath of the bankruptcy of Lehman Brothers, they successfully completed trades worth trillions of dollars in a multitude of financial instruments across listed and over-the-counter markets, and so helped avert financial Armageddon. That success transformed the business of clearing. Governments and regulators around the world gave CCPs and the clearing services they provide a front-line role in protecting the global economy from future excesses of finance. CCPs, which mitigate risk in financial markets, responded by greatly expanding their activities, notably in markets for over-the-counter derivatives, and often in fierce competition with one another. In The Risk Controllers, journalist and author Peter Norman describes how CCPs operate, how they handled the Lehman default, and the challenges they now face. Because central counterparty clearing is a complex business with a long history that continues to influence decisions and structures even in today’s fast changing world, The Risk Controllers explores the development of CCPs and clearing from the earliest times to the present. It draws on the experiences of the people who helped to shape the business of clearing today. It sets the development of CCPs and clearing in the broader context of changes in society, politics and regulation. The book examines turning points, such as the 1987 stock market crash, that set clearing on a new path and the impact of long running trends, including the exponential growth of computer power and the ebb and flow of globalisation. Written in non-technical language, The Risk Controllers provides a unique and accessible guide to CCPs and clearing. It is essential reading for clearing professionals, legislators and regulators whose job it is to take this vitally important business into the future. Peter Norman is a London-based journalist and writer. 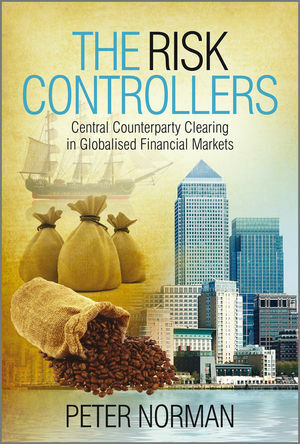 The Risk Controllers: Central Counterparty Clearing in Globalised Financial Markets is his second book explaining the workings and history of an important financial infrastructure. Plumbers and Visionaries: Securities Settlement and Europe's Financial Market, his path-breaking account of the history and prospects of the securities settlement industry in Europe, was published by John Wiley & Sons in December 2007. Peter Norman began a career in journalism in 1968, when he joined Reuters Economic Services in London. He later worked for The Times (of London) and the Wall Street Journal - Europe - before joining the Financial Times in 1988 with responsibility for the newspaper's UK and international economic news coverage. He was the FT's economics editor between 1992 and 1995. Peter Norman spent 22 years of his professional life on the European mainland, based at various times in Frankfurt, Bonn and Brussels. After three years in Bonn as the FT's chief correspondent in Germany, he moved in 1998 to Brussels as bureau chief and chief EU correspondent. He has combined authorship and journalism since returning to the UK in 2002. Peter Norman was born in 1947, is married, with two adult children. He was educated in England at Hull Grammar School and Worcester College, Oxford, where he studied modern history. He is a member in the UK of the Society of Authors. PART I CLEARING UP THE CRISIS. 2 The Modern Central Counterparty Clearing House. 2.1 The CCP’s Unique Selling Point. 2.2 Trading Venues and Clearing Markets. 2.4 Clearing Derivatives and Securities. 2.5 CCPs as a Business. 2.6 Netting Trades and Open Interest. 2.7 Vertical and Horizontal Clearing Systems in the US. 2.8 Vertical Versus Horizontal in Europe. 2.10 Clearing up a Crisis. 3.2 LCH.Clearnet in the Front Line. 3.3 LBIE – A Difficult Default. 3.5 The Picture in Paris: LCH.Clearnet SA. 3.7 Immediate Lessons from the Default. 3.8 LCH.Clearnet Stands the Test. PART II THE ROAD TO CENTRAL COUNTERPARTY CLEARING. 4.1 The First Traders and Post-Trade Practices. 4.2 Clearing in the Dutch Golden Age. 4.3 The Spread of Clearing Houses. 4.4 The Dojima Rice Market. 4.6 Trading and Clearing Cotton in Liverpool. 4.7 Futures and Clearing in Chicago. 4.8 Anti-Gambling Sentiment in the US. 5.1 Breakthrough in Le Havre. 5.2 The Functioning of the Caisse. 5.3 Europe Follows Le Havre’s Lead. 5.4 Anti-Gambling Sentiment in Europe. 6 The London Produce Clearing House. 6.3 LPCH: Sugar and the German Connection. 6.4 A Divided Market and a Clearing Competitor. 6.5 LPCH and the First World War. 6.6 LPCH: An Awkward Recovery. 6.7 Forced Inactivity and the Sale of LPCH. 7 Complete Clearing in North America. 7.1 The Minneapolis Clearing Association. 7.2 Minneapolis: A Neglected Innovator. 7.3 The Gradual Spread of Complete Clearing. 7.4 A CCP for the CBOT. 7.5 The Board of Trade Clearing Corporation. 7.7 Global Postscript: Separating the Weak from the Strong. 8 The Collapse of Bretton Woods and the Invention of Financial Futures. 8.1 The Return of Peacetime and Economic Growth. 8.3 New Activities and the Coming of Computers. 8.4 Floating Currencies and Financial Futures. 8.5 Options, Interest Rate Futures and Cash Settlement. 8.6 The Influence of Regulators. 8.7 Horizontal Integration for US Equities Clearing. 8.8 Financial Futures in the UK. 9 The 1987 Crash, Regulation and CCPs. 9.3 Cross Margining, TIMS and SPAN. 9.4 Near Disaster in Hong Kong. 9.5 The Collapse of Barings. 9.6 The Reaction of Regulators. 10 Continental Europe – CCPs in the Slipstream of Exchanges. 10.2 European Union, EMU and Europe’s Single Market. 10.4 Corporate Manoeuvring in France. 11.1 User-Governed CCPs in the UK and US. 11.2 The UK: from ICCH to LCH. 11.3 New Products: RepoClear and SwapClear. 11.4 The Creation of DTCC. 11.5 The Options Clearing Corporation. PART IV CCPs IN A DECADE OF BOOM AND BUST. 12.1 Challenges of the New Millennium. 12.2 Users Demand Lower Costs. 12.3 IPOs for Financial Infrastructures. 12.4 Europe’s Divisive Consolidation of Post-Trade Service Providers. 12.5 The Non-Appearance of Transatlantic Clearing Solutions. 12.6 Regulators Torn Between Safety and Competitiveness of Financial Markets. 12.8 Concentration Among Clearing Members. 13 The Chicago Roller Coaster. 13.1 Common Clearing for Screen-Based Traders. 13.2 Marry in Haste; Repent at Leisure. 13.3 CBOT and BOTCC on Different Trajectories. 13.4 The Ascent of the CME. 13.5 After the CFTC’s Decision. 13.6 Vertical Integration and Open Interest. 14.1 The Need to Mitigate Risk. 14.2 Operational Risk and 9/11. 14.3 International Standards for CCPs. 14.4 Conflict and Innovation in Asia. 14.5 Enron, ICE and Clearing OTC Energy Derivatives. 14.7 A CCP for Credit Derivatives? 15 Cross-border Clearing in Europe. 15.2 Clearnet: Europe’s First Cross-Border CCP. 15.3 LCH and Clearnet Consider Marriage. 15.4 The Quest for a Single Central Counterparty. 15.5 LCH and Clearnet Finally Merge. 16 Post-trade Policy in Europe. 16.1 Fragmented Regulation: The Example of LCH.Clearnet. 16.2 The First Drafts of EU Post-Trade Policy. 16.4 The EU Commission Moves Towards Legislation. 16.5 McCreevy Pushes for an Industry Solution. 16.6 Competition Authorities Against Vertical Silos. 16.7 The Eclipse of the Single CCP. 16.8 Interoperability on the Menu. 16.9 The Code of Conduct. 16.10 Problems with the Code of Conduct. 17.2 Tupker and Liddell Take Command. 17.4 ICE, Liffe, Rainbow and the LSE. 17.5 LCH.Clearnet Seeks Safety With Others. PART V NEW PARADIGMS: CLEARING AFTER THE CRISIS. 18 Mitigating Risk in OTC Markets. 18.1 Too Big and Too Interconnected to Fail. 18.2 Clearing as High Politics. 18.3 Activism at the New York Fed. 18.4 Mistrust Across the Atlantic and Inside the EU. 18.6 Twin Tracks Towards Legislation. 19.1 New Products, New Contenders, New Horizons. 19.3 DTCC and LCH.Clearnet Unveil their Merger Plan. 19.5 The Battle for LCH.Clearnet. 19.8 Security for the Buy-Side. 20.1 Competition, Proliferation and Expansion. 20.2 Falling Fees for Clearing European Equities. 20.3 Clearing Algorithmic and High-Speed Trading. 20.4 Interoperability in Europe: Progress and Setback. 20.5 NYSE Euronext Plans its Own European Clearing Houses. 20.6 Challenges to the CME. 20.7 Clearing at the LSE: Symptomatic for an Industry in Flux. 20.8 A Different Future for LCH.Clearnet. 21.2 ‘EMIR’ – The Draft European Markets Infrastructure Regulation. 21.3 Basel III and CCPs. 21.5 CCPs Spread Around the World. 21.6 An Asian Century for Clearing Houses? Appendix A: References and Bibliography. Appendix C: Abbreviations of Company, Industry Group and Regulators’ Names.